Joining MRN a decade ago, Samantha’s drive, passion and immense experience encompass her role as Head of Costs for Manchester. Samantha was called to the Bar in 2006 after the successful completion of her Law Degree. Following this, she took part in an intensive costs course at Legal Cost Negotiators that covered all aspects on both Claimant and Defendant parties. 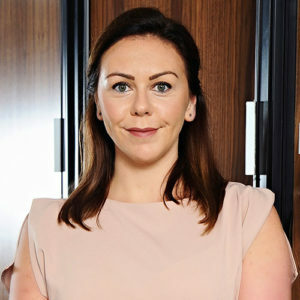 Her strengths are of abundance with her focus being on all areas of costs in high value and vastly complex matters of Personal Injury, Clinical Negligence and Commercial Litigation, often exceeding a million pounds. From preparing Budgets to drafting Bills of Costs and attending Hearings and Detailed Assessments when necessary, Samantha follows her cases from the cradle to the grave. She is able to remain objective when anticipating the moves of the opposing party and direction of the case due to her experience on both Claimant and Defendant sides. The strategic advice she is able to provide because of this is always profusely beneficial to her client. Samantha’s advocacy successes are of abundance and can be attributed to her vast legal experience, technical knowledge and fighting spirit. Her passion for advocacy has been strongly growing since being called to the Bar, as she built on her advocacy skills and combined them with her strong technical knowledge, unleashing the roaring fight and desire to win within her. With her caseload being high value and complex matters, Samantha has worked on many notable and significant cases. Most recently, Samantha prepared a Bill of Costs for a lengthy and intricate Road Traffic Accident matter when the Claimant sustained catastrophic injuries and was left severely disabled. The damages were eventually agreed at a Joint Settlement Meeting for £8.2 million. This Bill totalled £1.05 million and Samantha successfully recovered almost 80%. In another extremely challenging multi-million pound Commercial Litigation matter, the Claimant sought damages for losses suffered as a result of alleged fraudulent misrepresentation. For this matter, Samantha was involved in preparing a Bill of Costs for the Defendant party in excess of £685 thousand. The Defendant party successfully defended the claim and are therefore entitled to recover costs from the Claimant. Samantha is soon to be defending this Bill at an anticipated three-day Detailed Assessment. In her role as Head of Costs, it is also Samantha’s responsibility to ensure all fee earners are consistently developing their skills and abilities from the moment they walk in the door of MRN. She is passionate in ensuring everyone is provided with the necessary training by creating mock hearings and continuously monitoring the quality and accuracy of their work. By playing a vital role in the team’s development, Samantha is able to ensure everyone is on the best path to prosper their career. Outside of the office, you can find Samantha socialising with friends, indulging in a good read or at the gym!